One of the largest houses on the Smith Lake peninsula. Kestrel is the ultimate lakeside house for the fussiest of holiday renters. This stunning architect designed home with its luxury furnishings and quality inclusions, boasts loads of glass, enormous entertaining decks and generous sun filled indoor/outdoor living areas. Be captivated by sparkling views from almost every room. Enjoy the beautiful sunsets across the lake, ever abundant fauna and your favourite water sports at the door. A magical place to stay with all the luxuries to enjoy a perfect holiday. You will not want to leave. Pacific Palms is a small enclave locked in by Myall Lakes National Park, Wallis Lakes, Smiths Lake, Booti Booti National Park, and the Pacific Ocean. Together make over 100 kilometres of lakes hugging the coastline with only sand dunes a lot of the time separating the lakes from the ocean. 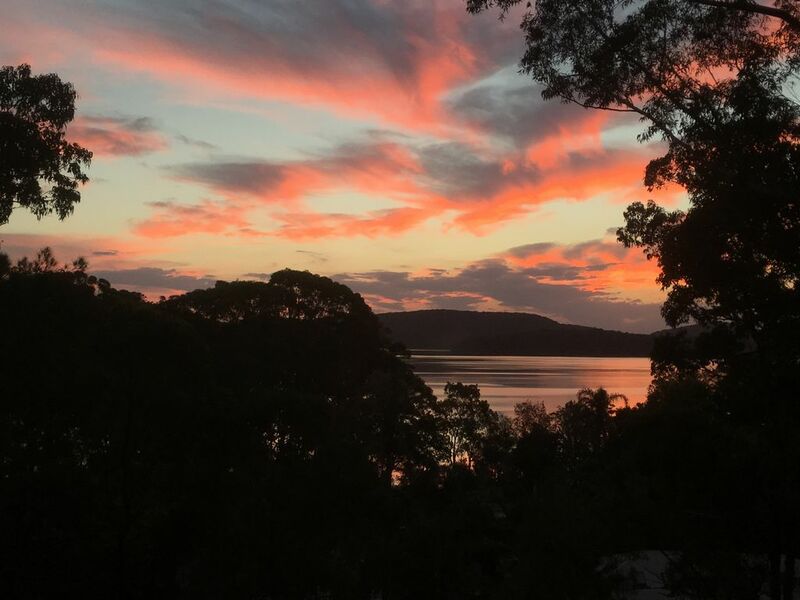 Smiths lake is located in between Myall Lakes and Wallis Lake and is 20 mins drive south of Forster and 2.5/3.5 hours drive from Sydney. The house sits elevated high on the ridge overlooking the lake beach and distant islands. The position is second to none in Smiths Lake, enabling you to enjoy the spectacular scenery, the sun and the views! The house is also a short stroll to the local shops: bakery, grocery, butcher, liquor shop, take-away, hairdresser/beautician and is next door to the famous 'Frothy Coffee' Cafe/boatshed (what more do you need)! * Best Mid North Coast surf beaches of Blueys, Boomerang and Elizabeth and Celito within 5 minutes drive for all your favourite water sports. * Iconic Frothy Coffee Boatshed serving delicious light lunches, dinners and snacks is just next door with canoe, sailing and motor boat hire available. * Amaroo beach is ideal for small children as the water is walm, shallow and calm. * Smiths lake is known for its scenery, fishing, water skiing and more recently Kite boarding. * Main bedroom with ensuite and walk in robe and Spa bath. * 2 TV's, FOXTEL PAY TV, CD/DVD, HiFi and excellent TV reception. * Gas BBQ & outdoor setting with sun lounges and Hammock. * Full laundry facilities with dryer. * Mobile reception is excellent. * Linen not supplied but can be arranged at extra cost. * 1 Cot, 2 high chairs and a baby change table. * Pets and Smoking are not permitted inside the house. * Pets are permitted but only with our approval. * The village of Smiths Lake provides all day-to-day requirements, with an excellent Butcher, Baker, Corner/Grocery store, City Style Cafe, Hairdresser and Liquor store. DVD's also available at the grocery store. Fabulous big house set high in the trees , Kookaburras at your door . Our stay was great and the weather excellent . The steep driveway was a bit scary though . Fabulous house - stunning views - spacious - tasteful décor - ample space for an extended family with lots of bedrooms, bathrooms, seating, etc. We thoroughly enjoyed a long weekend with the family. The location is perfect - right next to the Frothy Coffee Café, and a short drive to spectacular beaches. Loved it !! We stayed at Kestrel for 4 days from June 25 2015. Plenty of room for 6 adults and 5 children + heaters and an aircon upstairs. The little ones skipped up and down the stairs and outside exploring. We were right next door to the Frothy Coffee boatshed and cafe, great for parents. The playground alongside was top fun for kids. Loved watching sunset over the lake in such a peaceful setting from the big upstairs living area. 3 bathrooms and a big barbeque on the top verandah were appreciated. Helpful owners let us check out late when we had trouble tearing ourselves away to return to Sydney. Cellito's Beach is quiet and beautiful, accessed via a boardwalk through a little rainforest. There is a shortcut to it from Smith's Lake on a muddy track for intrepid walkers. Or you can drive there from Lake's Way by turning off to the Golf course. Steep drive but we just parked on the road after unloading cars. Can not fail this property - we had most enjoyable stay there. The house design and location, rooms decorations and comfort - just excellent, that's not mention stunning view from the balcony, fully equiped kitchen with 2 fridges, huge entertaining area and a canoe! Thank you Karla and David from all 10 of us! PS Could be challenging for someone with limited mobility, as the house is build on the steep hill. massive place, plenty of room, good facilities, great place to get a crew of friends and make the most of the area. Just right for a lovely extended family weekend. Seven adults and four kids easily accommodated. Everything you need for a pleasant stay.